1969 Alfa Romeo Giulia / Berlina / 1300 GTJ Novelty Press Kit. 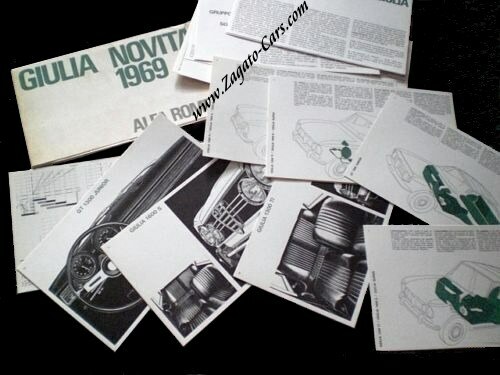 Vintage 1969 "Novelties" press kit, issued by Alfa Romeo and covering the 1969 Alfa Romeo Giulia, 1969 Alfa Romeo Berlina, 1969 Alfa Romeo 1300 GTJ Bertone Coupe. Consists of a portfolio of approximately 35 x 20.5 cm which contains 25 cards with relevant information, drawings and images. Excellent condition for its age but the portfolio itself has some minor wear.